Question: The graph below shows Rahim’s time spending on various activities. Describe the chart in 150 words. 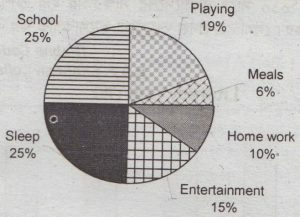 Answer: The pie chart shows how Rahim passes his time doing various activities. In the chart Rahim’s time has been shown in percentage, the total being 100%. The chart shows that half of Rahim’s time is spent in school and sleeping. The other half is spent on playing, taking meals, doing homework and entertainment. Rahim passes 25% time in sleeping and the same amount of time, that is, 25% time in school. Thus, he spends more time in these two activities. Playing games is important to Rahim and so he spends some time playing. He keeps 19% time for this. The next in importance to Rahim’s activities is his passing time in entertainment. It takes 15% of his time. However, Rahim also spends time doing homework, and that covers 10% of his time. Last of all 6% of Rahim’s time is spent on taking the meals. Thus, Rahim passes his time in sleeping, keeping in school, playing games, in entertainment, doing homework and taking meals.